Just in time to stay with the topic of lawn coversions, a friend of ours in Los Angeles sent us photos of a project we helped with. 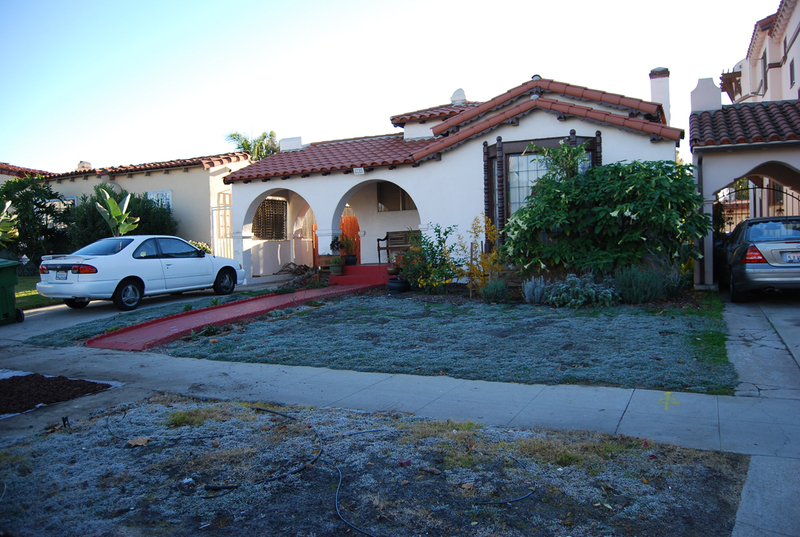 He’s a former roommate of Anita’s from the years when she was in grad school; he is now married and living in Los Angeles, and he recently bought a home with one of those terrible Southern California front yard lawns. He sent us some photos, asking for a planting plan to replace it. He and his wife wanted to keep the existing citrus tree and Brugmansia, they liked lavenders and succulents, and they wanted to do the work themselves. We sent him a drawing with some big caveats about how we had never gardened in Los Angeles so he would need to double check the plant suggestions with the local nurseries. That was last winter. This week he emailed us photos of the project, now completed. We had argued for taking out the red walkway heading straight to the door. We suggested replacing it with a DG path, figuring it would be easy to install and easy to upgrade to tile or flagstone in the future. They went ahead and installed the upgraded path right away, hiring a contractor for that part of the project and doing the rest of the work themselves. 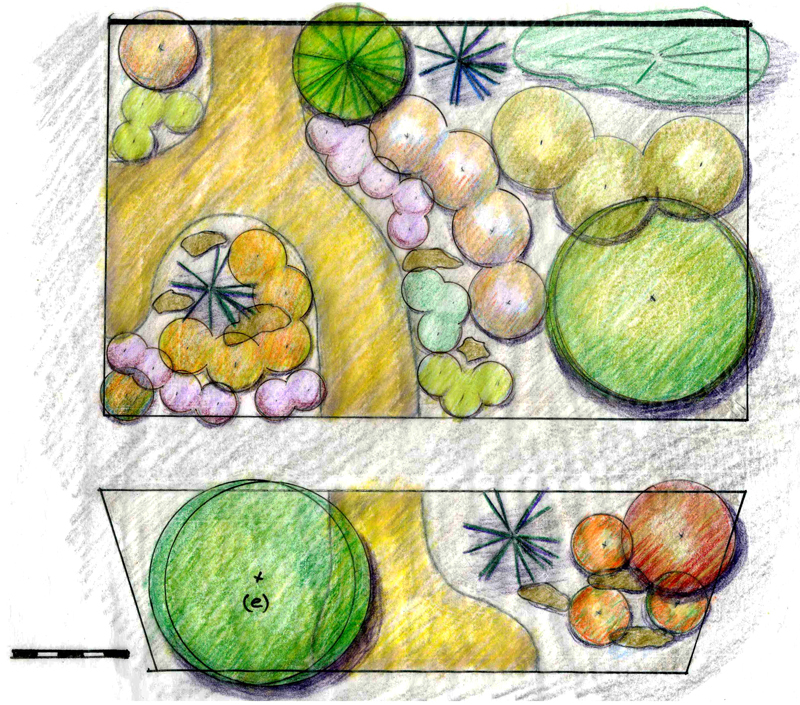 Most of the plants vary from the ones we suggested (probably a good thing), but they follow the basic layout of the drawing. When we named our lawn-conversion/sheet-mulch class Lawn Begone, we were joking about how sheet-mulching can have a certain magic to it, that it’s the closest thing you get to just pointing a wand at the lawn and casting some kind of goofy Harry Potter spell. This project — before and after photos appearing in our inbox, the not-quite-real quality it has because we never physically saw or visited the site, I never saw any of the work happen — takes the magic even a bit further. I’m about as skeptical of designing over the internet as I am of Harry Potter, but in this case it feels a little like we cast a spell and it worked. This entry was posted on Monday, September 26th, 2011 at 12:38 pm and is filed under lawn to garden, private gardens. You can follow any responses to this entry through the RSS 2.0 feed. You can leave a response, or trackback from your own site. That is an incredibly huge improvement. 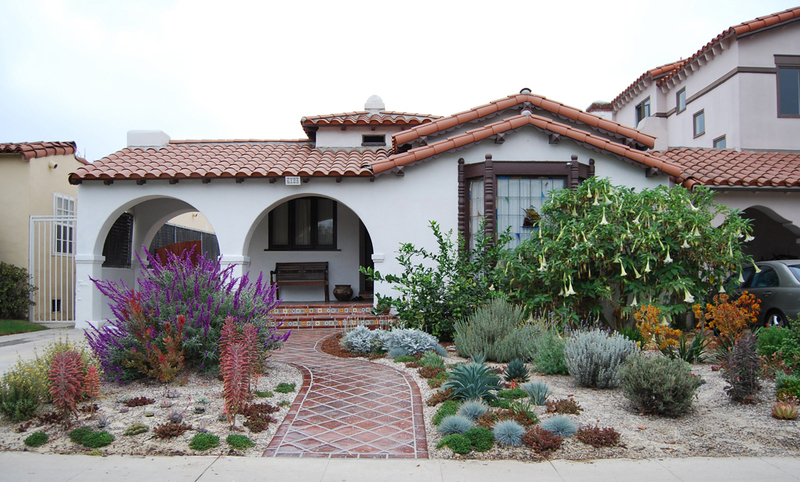 The path and that purple-flowering shrub are exactly what the house needed. I’m only sad that there isn’t an “after” photograph that includes the hellstrip, because I’d like to see what visual impression that wide spot at the street end of the path makes. I’m not sure what they did in the hellstrip. They did a good job with the flare on the driveway side, so they probably made it work along the street. What a lovely adjustment. 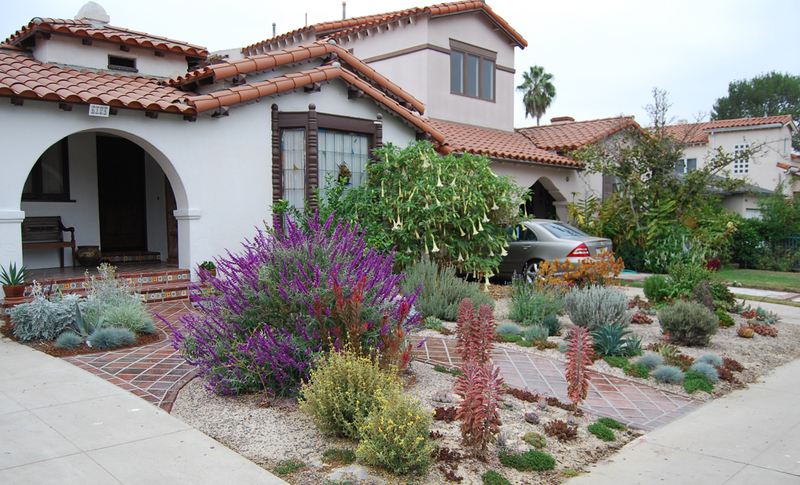 Even though we specialize in grass and lawns, we can always appreciate a nicely done dry stone or desert garden. What I appreciate in this particular garden is the variety in color and in vertical heights of the plants. Too many time desert gardens feature just small catcus or cover. Well done. Yeah California, but what about NY. Here on Long Island,Post Sandy, my lawn is shot, even to the point that the County has a program, called Weed and Seed, where they come and rip up the lawn,totally, even out the divots created by the flooding and then supposedly re-seed. But, that is an option, so I would like to put in a non-lawn front yard. I need urine resistant plan as my doggie uses the front lawn exclusively as does the next door neighbor’s dog. Do u do plans for brick cape’s in Northeast? We’ve done a few things back east. You could email or call me with details. The sidebar has a link to the website for our design build company with our contact information.